Yeay, another ‘Bubur Ayam’ street-food! Located quite strategically right in front of Al-Azhar University’s back entrance (just few meters behind the infamous Roti Bakar Eddy), where people usually pass through that route to avoid 3-in-1 traffic, there’s this humble street-cart with enormous neon lighting and WiFi. Yes, WiFi. That is new to me. 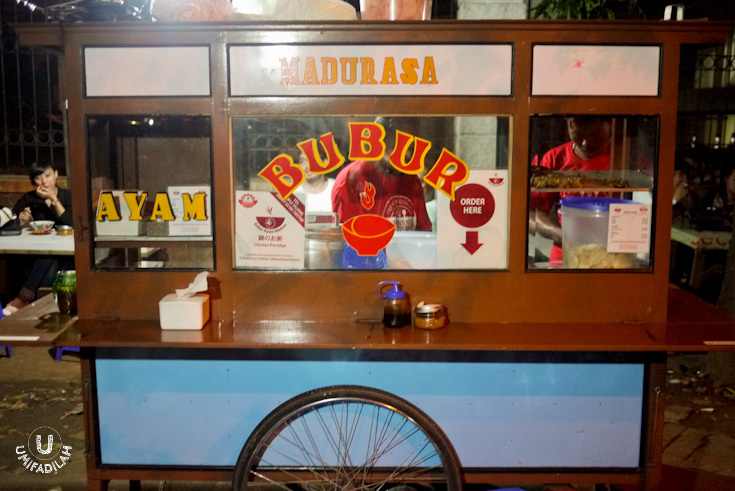 Other street-food vendors need to learn from Aditya Sani, the owner of Bubur Ayam Madura, which also happens to be a Strategist Consultant for one of our biggest telco company. Hence the FREE WiFi is sponsored by them – quite a breakthrough! I paid my visit about few weeks ago, and happened to meet the owner coincidentally. I guess he immediately noticed ‘the blogger stereotype’ because I was busy taking picture and everything, lol. The thing about blogger is, we often discover new places through social media buzz. And that’s what introduces me to @BuburAyamMadura at the first place. The flow is pretty much simple: People talk about new recommended places on Twitter, I check out their profile, timeline, and their photos to eventually someday pay a visit to quench that curiosity. Regular portion of Bubur Ayam Madura + chicken liver/gizzard satay (IDR 10.000 + IDR 1.500). Generous topping of shredded chicken, fried soy-bean, crackers, fried shallots, melinjo nut cracker plus the addition of satay just made it better as you mixed the porridge thoroughly and add a dash of sambal relish. A bit of warning, their sambal is HOT. 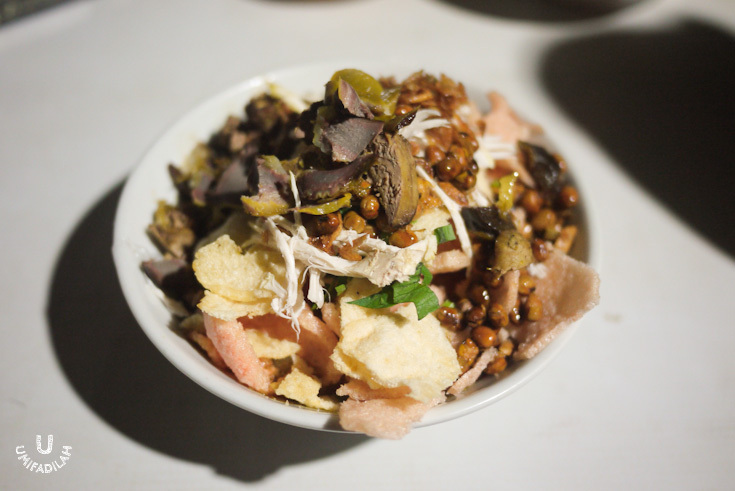 Another angle of Bubur Ayam Madura. Delicious? Yes. Fulfilling? Depends, because some people consider this as snacks only :p The minor feedback was just that the porridge itself has a slightly runny consistency, but again that is only a matter of personal preference. Special? Hmm, can’t say that it’s a taste I never experienced before (same goes with Bubur Ayam Senopati). After all it’s just an alternative for your daily dose of bubur ayam. But because it’s only open from 5pm onwards, it’s more likely a type of quick-grab meal right before you’re headed home post office-hours. One more thing that also grabbed my attention is their unusual way of marketing. Right now, they currently have special promotion for Office Boy (OB) workers – learning the fact that so many office workers utilize their Office Boys to buy them lunch meal – for every purchase of 10 Bubur Ayam Madura, the OB will also get 1 free meal for himself. Pretty clever way in helping the economy & at the same time make additional savings for the OB workers themselves. Well, do make a stop when you’re nearby! Image taken from their official website http://weekendcatering.net/. No credit infringement intended. Senin-Jumat (17.00 - 23.00), Minggu (07.00 - 11.00).